Commercial spaces can be difficult to light, based on design, efficiency, and cost alone. Some commercial spaces are multi-purpose office buildings, retail stores, parking garages, hotels, and restaurants. The list goes on and on, and many of these spaces require a multitude of lighting solutions for indoor lighting, security lighting, parking lot lighting, etc. 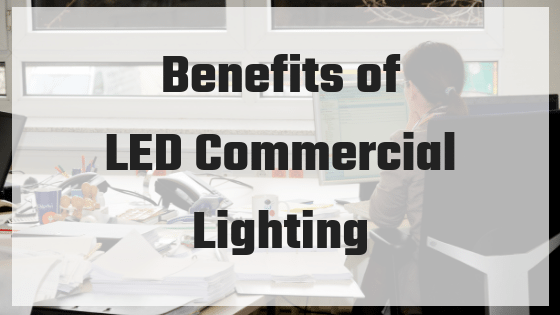 LEDs offer a way to flexibly light a commercial space for all of its needs. Not only do you have different product options, but color temperature, dimmers, motion sensors, and more to make the most of your lights. Let’s not forget the energy efficiency and money savings either! LED lighting is the easiest way to revamp your current commercial space, or modernize commercial spaces under construction. The most common, and out of date, lighting currently used in these buildings are fluorescents, high pressure sodium (HPS), and metal halide lights. They are up to three times less efficient and are 75 percent more expensive to power than LEDs. LEDs are a great option, as they require less wattage to provide the same, if not more, level of light as your traditional lighting. They also last upwards of 15 to 20 years, significantly reducing your maintenance efforts. It doesn’t get much more efficient than that! There is the common misconception about LED lighting that it is all severe, harsh, white/blue light. This couldn’t be further from the truth! LEDs come in a variety of color temperatures. If you are a restaurant owner looking for warm, cozy dinner lighting, we have a color temperature for you. If you are wanting brighter lights during the day and softer light at night, we can install dimmers. Do you need a revamp of your outdoor and indoor lighting? We have all the products you are looking for to transform your commercial space. Something as simple as lighting can make your space feel new again! We’ve said it once, we’ve said it twice, and we will keep shouting from the rooftops that LEDs will save you more money than any other bulb on the market! What makes LEDs so efficient? They require less wattage to produce even brighter light than a traditional bulb. Wattage tells how much power is needed to operate a single bulb. The less wattage needed, the less power used. For example, a 4 Watt LED can replace a 40 Watt incandescent light, while still producing 450 lumens. This makes the LED 4 times as efficient! Find Commercial Lighting Solutions at Sitler’s! Sitler’s prides itself on carrying a wide range of LED products for almost every space and place. Update your lighting today to be green and save some green! Give us a call at (319) 653-2123 or request a quote online!